Nebraska Charity Casino Party USA – Omaha in Kimball, Nebraska. 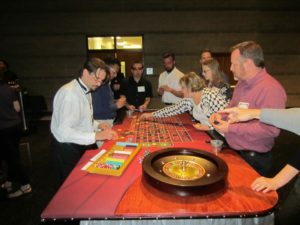 When planning a casino fundraiser, casino charity event, or charity poker tournament, having a realistic goal of how much money you would like to raise is the key to a successful event. This will determine the price of your admittance fee, script voucher prices and expenses. Once this key goal is determined you can then begin to figure out your pricing and expenses. The excitement and glamour of Las Vegas will come alive for your guests as they have the opportunity to play their favorite casino table games! Casino parties are the liveliest, most exciting, and most memorable party theme today and a dramatic way to break the ice among guests. Our casino theme party specialists will work with you to design a casino theme night package for your party and then set up the party at your location. We provide the best trained EMPLOYEE dealers who ensure that all your guests enjoy the evening. Don’t know how to play? 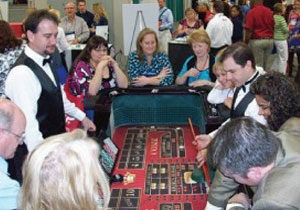 Don’t worry, all of our dealers are more than happy to explain how to play any of the casino table games. We use traditional Las Vegas rules and odds on all of our party tables.